Before the 1960s, any form of cardiac arrest almost assured death. In an attempt to save more lives, surgeon and medical innovator Peter Safar developed a combination of mouth-to-mouth breathing and chest compressions that would open up airways and maintain adequate oxygen levels in non-breathing victims that could resuscitate them. His system for cardiopulmonary resuscitation was adopted by the American Heart Association in the 1970s and has since been standardized as the process for CPR. Medical emergencies can occur at any time, and often without any warning, so getting CPR certified is a fairly simple and useful process that will equip you with the skills to respond quickly and properly when someone needs assistance. A CPR certification typically lasts for two years and is easy to obtain by attending a class at a certified training center. If you’re not planning on working as a lifeguard, teacher, babysitter or something in a related field, it is still smart to get certified even if your workplace doesn’t require it. You never know when you could be faced with the opportunity to save a person’s life. Do some research – The first step in getting your certification is to do some online research about the kind of class you will need to take. 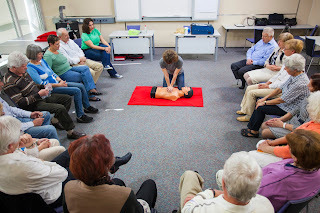 CPR classes are typically offered as either healthcare specific or for the general public and are designed to meet different needs based on whether the certification is required by your workplace or if you want to prepare yourself for an emergency situation. Search for classes – You can call your local gym or municipal swimming pool to see if they offer CPR certification classes, but you can also search online to find other training centers close to you. The Red Cross and the American Heart Association both have a useful search tool that allows you to search by zip code. Some centers will offer both classroom and online class options, but be wary of online classes that don’t require you to come in for a skills evaluation at the end of the course to receive your certification card - this is usually a scam and most workplaces won’t accept a print-out certification card. Register for classes at your convenience – Classes are usually offered year-round, so you can obtain your CPR certification whenever you have the time to do so. If you are under some time constraints to receive your certification, find out how long it will take to receive your card so you can plan accordingly. Some training centers will present you with it after your final in-person skill evaluation, while others may be mailed to you after completing the course. Attend classes and get certified – Congratulations! You’ve completed your course work, gotten your CPR certification and are now ready to act accordingly in the event of a medical emergency! When acting quickly to resuscitate a victim can often mean the difference between life and death, getting CPR certified is a small price to pay when you know that you can save someone’s life. Visit American Heart Association and Red Cross for more information about CPR training and where you can find a training center near you.